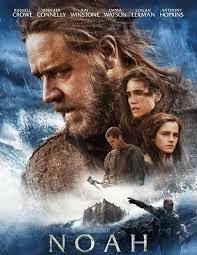 Review: Noah is a man who has been chosen by his world’s creator to protect his family and animals from an impending flood. It is a great film but it is not one of Darren Aronofsky’s best. As much as I enjoyed it I did find the beginning a bit too long. This might just be me but I thought that I would see Noah and his family working and building the boat. I thought there would be long shots of them all at work. Jennifer Connelly acted really well. Probably one of her best performances. The script could have been worked on a bit more and the special features just suddenly appeared out of no where without any real explanation. I didn’t really think much of Russell Crowe’s accent. Anthony Hopkins I felt just went in and did his part and didn’t really care. Couldn’t take him seriously enough. The music was fantastic although quite a lot of critics etc have criticized it. Very predictable plus you really know what is going to happen before you even start watching. Darren Aronofsky has been fascinated by the character of Noah since he was a child. Industrial Light and Magic worked on the animal scene and they spoke out about this saying ‘the most complicated rendering in the company’s history’. This film has had mixed reviews with the film critics.